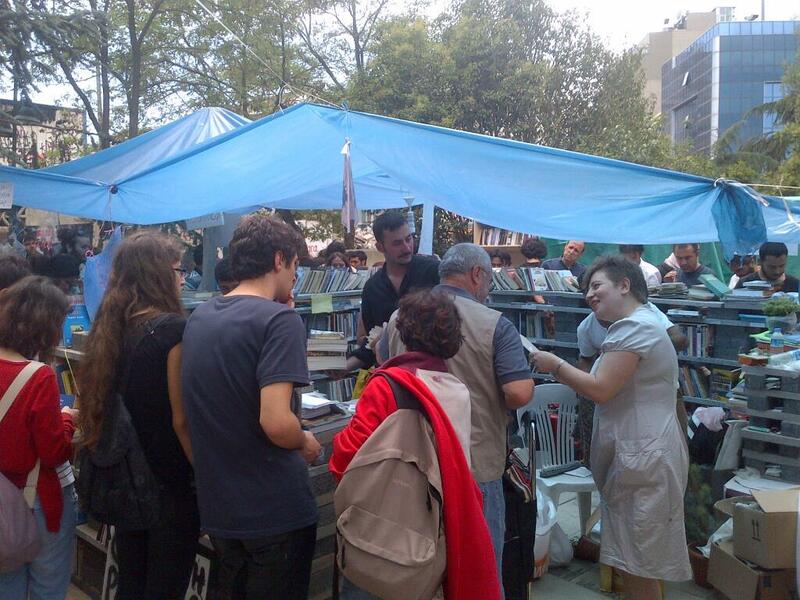 After the Gezi Park occupation was dispersed, dozens of neighborhood forums popped up around Istanbul where people get together to discuss a variety of issues. I’ve been attending these neighborhood forums, which are are organized in an “agora” format where speakers line up and take turns to speak. While media attention remains on the frequent Taksim Square demonstrations, the forums are lively, continue to be well-attended and are breaking precedent in Turkish politics which started with Gezi. To give a sense of the space, here’s the Abbasaga forum in Besiktas (at 12:30a on a Friday). In Gezi, one thing that struck me and that I’ve been tweeting about, and that came up in many of the 100+ interviews I conducted with the participants was the spirit of tolerance and diversity. Gezi protests participation included people ranging from nationalist/traditional Kemalists to Kurdish political parties, from the “internet generation” youth (as they are referred to here) to feminists, from “revolutionary muslims” to many ordinary citizens who do not fit into any of these categories. (By the way, the media, both here and abroad are missing the story–during the Gezi occupation, they concentrated on the occasional clashes in Taksim square. Now, during the neighborhood forum process, they still only cover Taksim protests. While important, that is not where the heart of the story is). Many people I interviewed in Gezi told me that, for the first time, they found themselves talking with people with whom they had rarely interacted, with whom they had harbored prejudices, and with whom they had never had this kind of deep, political and substantive conversations. 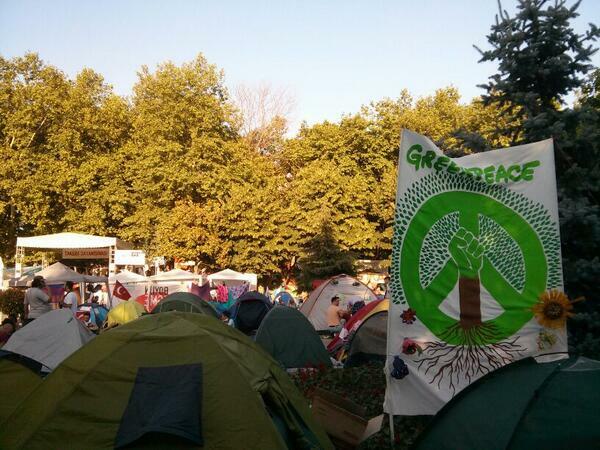 It emerged as the most personally satisfying aspect of the Gezi Park experience for many participants. This unity was helped along by the police repression as well as Erdogan’s totalizing, polarizing rhetoric in which protesters were alternatively referred to as marginals, looters (“çapulcu” which became the term they adopted for themselves), terrorists, etc. Being stereotyped in so many negative ways helped create this identity of one of unity and tolerance within difference. 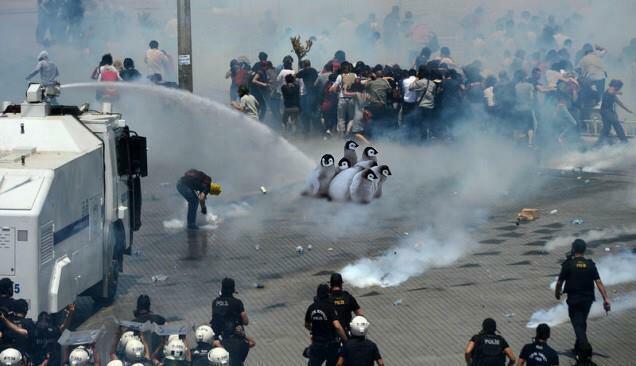 A famous photo from the Gezi Park period illustrates has become a symbol of this Post-Gezi politics in Turkey. 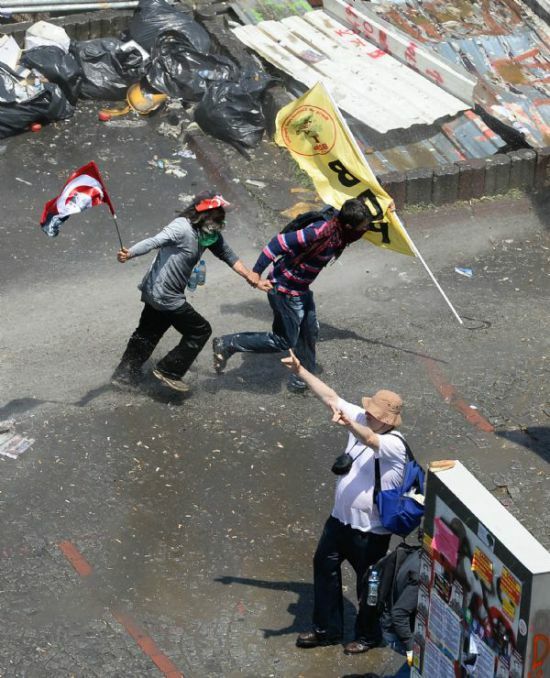 Running from the police in this picture are two youths, holding hands, one carrying a flag from the Kurdish BDP party and another an Ataturk (Kemalist) flag (ideologies that almost never speak to each other, or at least kindly). At the corner, another man makes the “wolf” sign that is traditional to ultra-nationalist Turks. To be honest, had I not seen, interviewed in, and experienced Gezi myself, I’d be trying hard to figure out if this was photoshop. 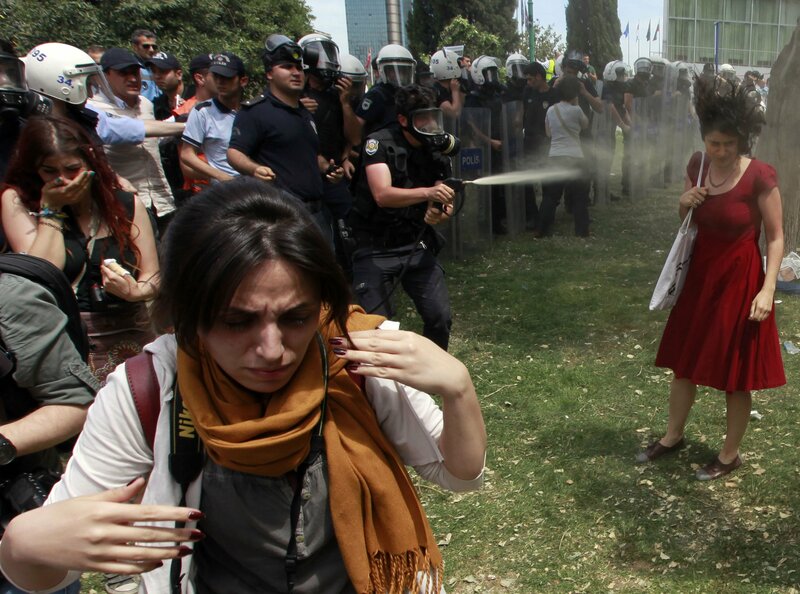 One can’t help by feel incredulous by such scenes in Turkey. It is, however, a true picture–a pluralist generation has sprung up in Turkey under AKP’s strong rule partly because of it, and partly as a reaction to it. And that, mostly, is at the heart of the political crises that is fueling Gezi. This pluralism has no political expression and no real reflection in mainstream media, which is a little more than a government parrot these days, or even “opposition” traditional media which remains relatively firmly encamped in totalizing or outdated ideologies. In sum, in Turkey, there is no political party or institutional infrastructure which reflects this generation or this emerging pluralism. In fact, people often call this “Gezi ruhu” or “spirit of Gezi” to try to find a name for this unprecedented political coalescence. I have come to think of this moment as an anti-postmodern pluralism. Unlike early stage (or, well, “traditional”) postmodern approaches, the “other” is not configured as an opaque, unknowable, “outside” entity. There is multitude but there is also unity and a unifying grand narrative–a unity that is based on empathy rather than a single model of the desirable. The “other” is knowable through common human experience and suffering. Hence, this is not like post-modernity which rejects unity or gran-narratives. In fact, it is striking how strong the grand, unifying narrative is among many participants. As such, pluralism and tolerance are perhaps the most significant political values emerging in the post-Gezi politics. For example, after a shooting in Kurdish Lice over tensions about building of new military posts, people in forums in Besiktas and Kadikoy, nationalist strong-holds, marched in support of Kurdish grievances. This would have been hard to imagine a month ago. I have seen feminists conduct workshops in Gezi –specifically targeted to to soccer fans– on why they should not use misogynistic insults. Muslim groups in Gezi distributed “kandil simit” –traditional for Prophet’s birthday– in Gezi and held prayers on that Islamic holy day. I’ve seen Muslim groups praying in Gezi while a woman with crewcut, punk haircut –clearly not part of “them”– shood away journalists trying to take pics, who she thought was not respectful to their prayer. “They are praying, not putting on a show for you” she exclaimed and made the journalists keep their distance. Perhaps the most interesting configuration to have emerged from the Gezi protests has been the LGBT community in Turkey. Long oppressed, it is also a community that has long struggled openly. Unlike other countries in Middle East, Turkey has a strong and burgeoning LGBT community that is increasingly coming out of the closet and organizing. Like other countries in the Middle East, they face grave prejudice and oppression. LGBT neighborhoods (Turkey’s “Castro”) in Istanbul are concentrated around Taksim and Gezi Park is, so to speak, in their backyard. They were among the first protesters to try to protect the park and they have been central to its defense and organizing from the beginning. Along the way, they have acquired respect and status among many people who participated in the Gezi process. Another key player in the Gezi protests has been “Carsi” –Turkey’s ultras who are fans of Besiktas soccer team. Carsi is known for their rowdy marches, bravery, somewhat unusual ingenuity which at one point involved hotwiring a back-hoe to push back against police APCs, and, unsurprisingly, their machismo. Predictably, soccer fans adopted this slogan to politics in Gezi and started referring to various AKP officials as such. Predictably, the LGBT folk were not happy. They approach the soccer fans, Carsi, and asked them not to refer to AKP politicians –or others– as “ibne.” “We are the fags and real fags are here defending Gezi Park” they explained to the bewildered Carsi supporters who probably had rarely seen anyone proclaim the identity as a source of pride. However, Carsi had also seen the LGBT folk brave police repression–which the LGBT people explained is part of everyday life for them. Soccer fans, too, had often experienced clashes with the police. An understanding was not impossible. In another instance in Gezi Park, I witnessed a Kurdish “teyze” (an older, traditional woman) from southeast Turkey in a heated, compassionate conversation with one of Istanbul’s better known transgendered activists. The dialogue, which I witnessed, was mostly about the need to love and understand each other’s suffering. During this conversation, the Kurdish “teyze” spoke in a thick, Zaza (a dialect of Kurdish) accent while the transgendered activist hugged the rainbow flag he had been waving and used speech locutions that are very specific to the gay community in Turkey. It ended up with them hugging in tears, vowing to keep in touch. It also ended with me having to sit down to catch my breath that I had just witnessed what I had just witnessed. I’m not sure I’d have believed all this was possible a month ago. Clearly, though, it was in the making–it did not come out of nowhere. Rather, AKP’s strong hand in governing has created constituencies for whom plurality and tolerance is a key value. 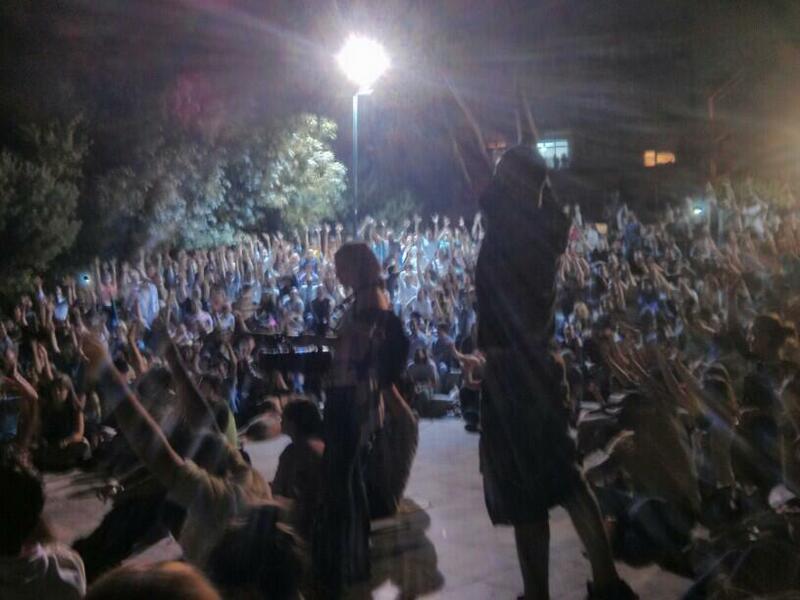 As one Gezi participant said to me: “my problem is that this man [Erdogan] wants to paint us all black. We are a rainbow! There are many colors!” Hence, this tolerance was not just a momentary convenience, but a value that has emerged from an experience of feeling and being shut out. It’s unclear how much this pluralism will carry on in the future–or how widespread it is in the country in general–but it is a striking and a potentially deeply transformative experience for the participants in the Gezi process as well as the ongoing neighborhood forums. So, I come to today. 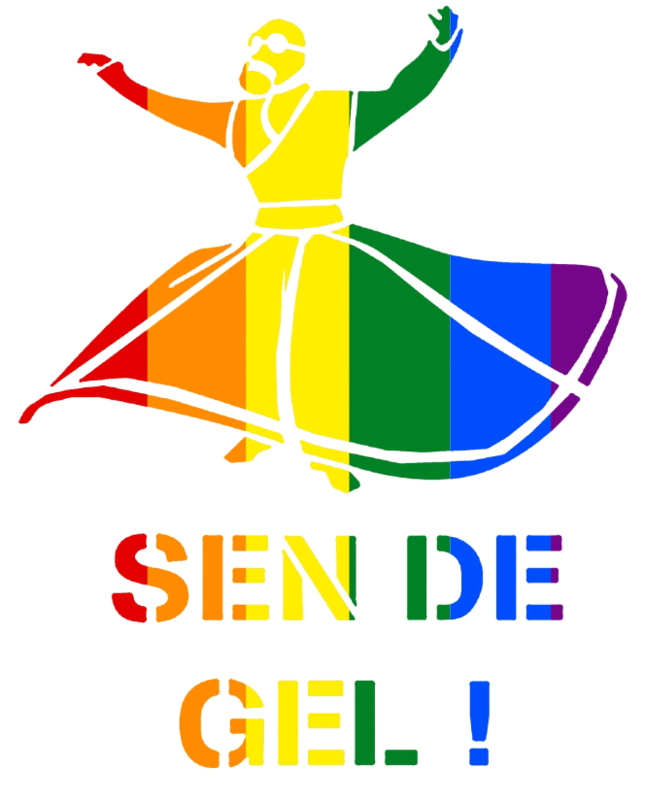 In a few hours, the 11th LGBT pride march will start in Taksim. It is the first march with a “permit” in Taksim since the beginning of Gezi protests (though nobody really seems to be taking permits that seriously these days). Many groups, well, pretty much everyone, who has been a part of the Gezi protests will be attending. Most neighborhood forums I attended have expressed a desire to march as well. This might be the first time that Turkey’s LGBT community leads –and is not just tolerated– a large and diverse march of dissenters whose unifying ideology is emerging as tolerance and plurality. Today, in Turkish twitter, “#direnayol” is trending which brings together Gezi politics with LGBT symbolism. “Ayol” on the other hand, is the Turkish linguistic equivalent of a “limped wrist.” It literally connotes a sense like “darling.” So, to say “gel, ayol” is a bit like saying “come, darling.” In Turkish “ayol” is also a symbol of gay speech, a locution that can be added to sentences to convey a queer sensibility. For example, “Ayol, it’s an actual revolution” (“ayol, resmen devrim”) had become a slogan of the LGBT community during the Gezi events. 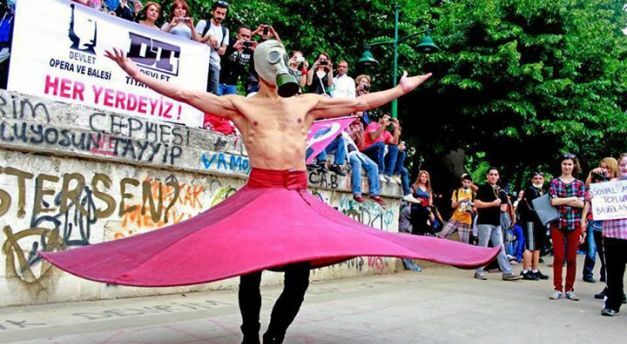 During the Gezi Park Protest, a whirling dervish in a gas mask visited Gezi park (of course, right?) and the image was widely circulated, often along with the saying “Sen de Gel” — a saying meaning, “you, too, come”, from a sufi poem by Rumi. So, perhaps, I’ll end by answering a question many friends of mine have asking me–should I come to Turkey during these turbulent times? I’ll repeat the answer I’ve been giving all along. Yes. I’ve even joked that the unsafest part of my visit to Turkey was the ride from the airport in a taxi that had removed the seatbelt–and I mean it. Istanbul is a big city and usual big city precautions apply–and Taksim at the height of a protest is not advisable if you have children with you. Other than that, yes, do come to Istanbul. Especially now. This is not a caravan of despair. This entry was posted in Uncategorized on June 30, 2013 by zeynep. I write occasionally for other outlets besides my blog. Hey, some of them are even academic papers! 🙂 People have been asking me for a selection so here you go. Networked Politics from Tahrir to Taksim: Is there a Social Media-fueled Protest Style? : Analyzing the commonalities, strengths and weaknesses of social-media fueled protests around the world. Be Quiet and Don’t Move So You Can Be Heard : Analyzing how and why the “Standing Man” / “Duran Adam” protests in Turkey came to be. “Not This One”: Social Movements, the Attention Economy, and Microcelebrity Networked Activism: An examination of the “attention economy” and social movements that starts with conceptualizing attention as a distinct resource, analyzes how existing theories of social movements are altered by decoupling of attention and mass media and concludes with a case study from Bahrain as well as examples mostly from Arab Spring countries. Occupying the Political: Occupy Wall Street, Collective Action, and the Rediscovery of Pragmatic Politics: A comparison of NAACP-style 20th century activism and Occupy Wall Street style 21st century movements, with special emphasis on the weaknesses of social-media fueled activism when it comes to strategic political action. (With Daniel Kreiss). Also, let me repost two very early pieces that remain relevant. Delusions Aside, The Net’s Potential is Real: This is a pre-Arab Spring piece which responds to Evgeny Morozov’s first book, the Net Delusion, which I thought made some good points and included important corrections to some of the existing hype but also missed the big picture about the Internet’s potential (and was too Internet-centric, in my opinion, and conflated other structural failures with weaknesses of Internet’s impact on social movements ). I am happy to say I stand by my pre-Arab Spring review and feel like history has played out largely in favor of my arguments (though as I make clear in the review, I do not disagree with everything Mozorov said in the Net Delusion). What Gladwell Gets Wrong: This responds to Malcolm Gladwell’s article in the New Yorker which argued that Internet was not useful for social movements because it was mostly good for weak ties, and because social movements can only flourish from strong ties. I argued then that Gladwell suffers from not understanding the Internet, social movements, or how social ties operate, weak or strong. That one can almost pass without comment now (except to say that Malcolm Gladwell’s has a strong Igon Value Problem); however it is a good reminder of how primitive –and wrong– some discussion on the topic of social movements were just a few years ago. This entry was posted in Uncategorized on June 21, 2013 by zeynep. I have spent the last few days interviewing people in Istanbul’s Gezi Park protests as well as hanging out in the park, observing, chatting informally with everyone ranging from journalists to visitors to the park and occasionally getting massively tear gassed. My lungs continue to burn as I type this morning. Here’s an aerial view of the area. The park on the right is now a tent city, and that’s where the protest is taking place. It all started when the government announced it was going to tear down this area and build a replica of an Ottoman army barracks with a shopping mall potentially integrated into it. It’s one of the few remaining green areas in the popular Taksim neighborhood. The small group of initial protesters were attacked 5am in the morning, their tents burnt down, and trees started being uprooted. The news spread via social media, especially Twitter and Facebook, as well as SMS and phone calls, and people started congregating in the area in response. After massive clashes for about a day or so, the police withdrew and the area grew into a large tent city and a protest. 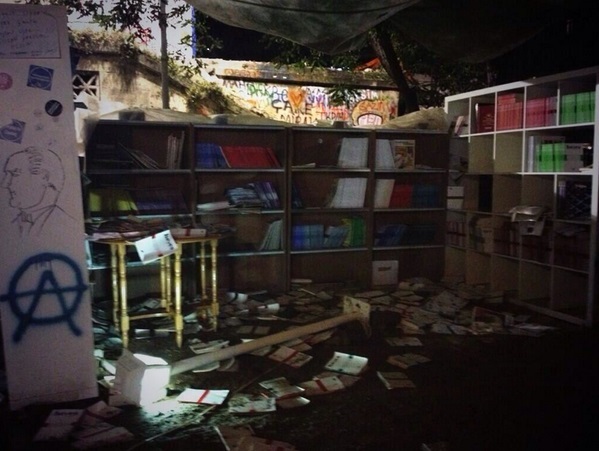 (The police and the clashes returned yesterday). For most of my time there, it was a festival like space: loud and boisterous, with occasional breaks for tear gas. During yesterday’s clashes, there were indeed a few people who threw “Molotov cocktails” at the police in the square –which you may have seen on TV because that is the kind of visual that television stations like to put on a loop– but in my observations, the Gezi park protesters are very alien to that kind of behavior. In fact, during those very clashes they tried to form a human chain around the park and stop such violence from happening. They made calls via their megaphones for it to stop. I have walked most every inch of the park and spoke to a wide range of people. The protesters I spoke with expressed strong commitment to non-violence. In fact, even the slightest scuffle is in the park calmed down immediately. I observed this first-hand when a visiting youngster, about 14 or 15, tried to pick a fight with an older man claiming that he had looked at his girlfriend the wrong way. Dozens of people immediately intervened, calmed the youngster, took him away, helped his girlfriend, asked her if she was okay, and generally made sure it was all calm again. “Not here, no fighting, not here” is heard as soon as any tensions arise. People are very proactive. This is not a let-and-let-live space in those regards (though it is in many others). Erdogan’s AKP party won the last election (its third) and is admittedly popular with many sectors of society, including some who are now in the Park have voted for him. It has accomplished many good things for the country through a program of reform and development. Any comparisons with Mubarak and pre-Tahrir 2011 Egypt are misplaced and ignorant. The country is polarized; it is not ruled by an unelected autocrat who has alienated everyone. For example, Erdogan recently announced that they would be building a third bridge over the Bosphorus strait. Many people felt that the plan was not discussed at all with the public and concerns about environmental impact ignored. Then, he announced that they had decided the bridge would be named “Yavuz Sultan Selim”–an Ottoman king (“padisah”) famous for a massacre of Alevi (Turkey’s alawites) populations. Unsurprisingly, Alevis who compromise a significant portion of the Turkish population were gravely offended. In the predominantly “GAzi” (not Gezi) neighborhood, people have been marching every night since the Taksim protests began. 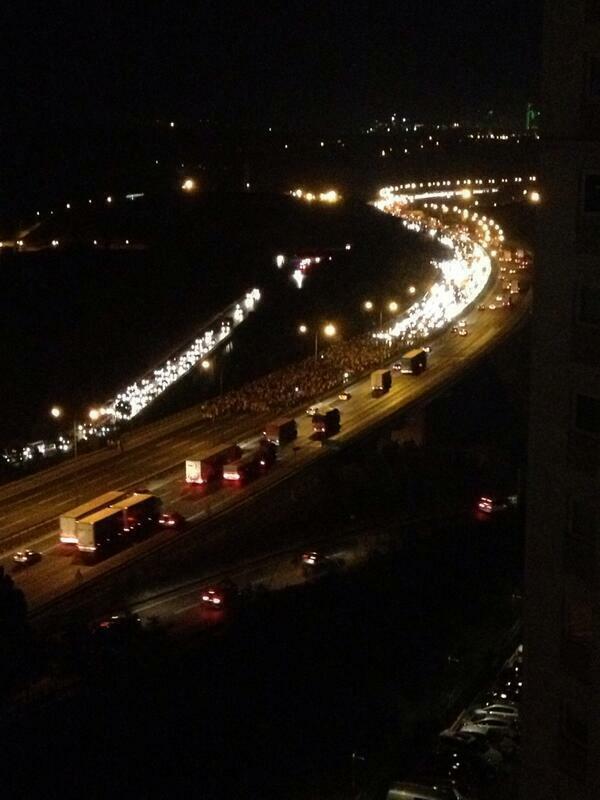 Last night, they blocked the main TEM highway for a while before voluntarily dispersing. 2- A very common and widespread complaint is about censorship in traditional. It is, indeed, much worse than I had thought. I had already blogged about how the CNN Turkey was showing penguin documentaries while the initial major clashes were ongoing, and while CNN International had a live feed to the clashes. In the square, I chatted with journalists and people who told me they were journalists but joining the protests after their shift ended. They told me, some in tears, that they are not free. They said that the stories they file are shelved. One told me of being told “why don’t you rewrite this column” after writing a sharp critique of Erdogan’s stance during Arab Spring versus his stance now towards the protests. I watched last night as the governor of Istanbul was “interviewed” on television on CNN Turkey (it’s not the worst or only awful one, but it’s notable.) 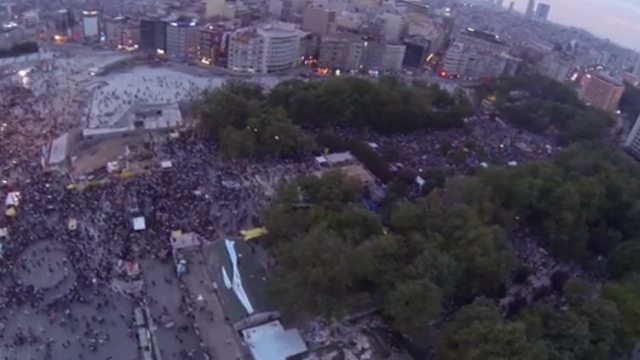 There were ongoing clashes all day, in the middle of the biggest city in Turkey. The governor had said in the morning that the park would not be attacked. I was in the park all day and was tear gassed on and off all day–this was thoroughly documented. (I left when things got much worse and I couldn’t breathe, or obviously do interviews anymore. I’m there to interview, not to be tear gassed beyond rhyme or reason). Instead of asking him tough questions, or even things that could be considered any kind of questions, the “interviewer” lobbed phrases that were so non-questions that “softball” would be a compliment. The “interview” ended with the “interviewer” asking the governor that perhaps they should end by having him repeat his call to parents. Oh, yes, the governor said. That’s a good note: “Parents should tell their children not to be in the park anymore. It’s not safe.” That is what passes for an interview. Also, the few channels who were broadcasting the protests live were JUST hit by large fines by Turkey’s regulatory agency, RTÜK, for “inciting people to violence.” The level of control over the public sphere via media is worse that I had thought, and I was already worried. The journalists I spoke with said to me that it’s not just intimidation by government–many media publishers are also large conglomerates and want to keep good relations with the government for their business interests. Unsurprisingly, social media, especially Twitter and Facebook have emerged as key protest and information conduits. Turkey also has no equivalent to “Al Jazeera” which played a major role during the Arab Spring. Most protesters I talked with said that this just wouldn’t be possible without especially Twitter and Facebook. Most people heard of what was going on in the park during the initial police attack (when the protest was small, the police moved in, burned the tents and started cutting down the trees) via Twitter and Facebook and showed up to try to protect the park. They couldn’t have heard it on mass media because it was broadcasting anything but the news. Penguins have become a mock symbol of the protest. 3- The police actions are a common cause of complaint among the protesters. The use of tear gas is quick and massive. This is not the first protest that has been subjected to massive tear gas. In fact, it seems to have become a modus operandi and main style of policing of demonstrations. Yesterday, while I was in the park, tear gas volleys regularly landed in the park. My interview recordings are interrupted by “gas breaks”: a bang, coughing. I watched people convulse and throw up from tear gas. I witnessed tear gas being thrown into the park when it was very crowded, creating a dangerous situation as people tried to run away and risked trampling. The park is experienced, though. As people panicked, lots of seemingly experienced protesters, started yelling for people to calm down, opening exits, helping people. One of the key demands of the protests is freedom as assembly and freedom from this kind of police intervention. Also, protesters were hit with tear gas canister–what had also happened in Egypt and killed many people. I personally saw a young man bleeding from the head on a stretcher being rushed to the “field hospital” area–which also got attacked with tear gas later. After him, another man came sobbing through the area. “They are aiming the canisters at our head. Aren’t they human? Aren’t we human?” he sobbed. 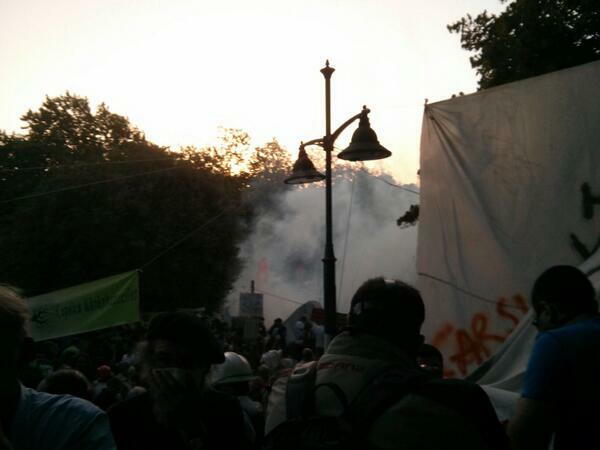 Here are some pictures during the day when the tear gas was lobbed inside the park. I don’t have a picture for some of the worst clashes when the park was basically engulfed in massive amounts of gas partly because it was a difficult situation and also partly because some of the worst happened after I left. These pictures are from June 11th, when the governor said the park would not be attacked. 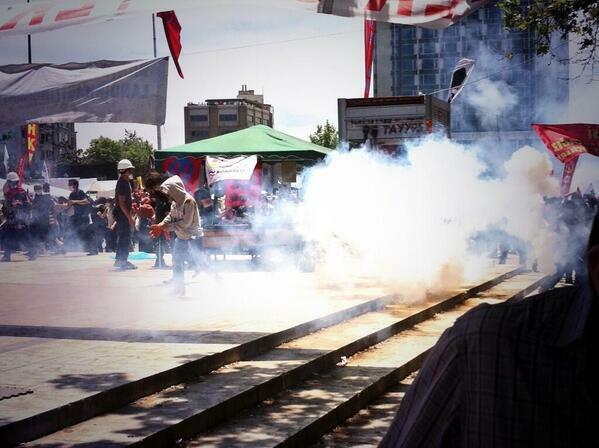 This one I took–one of the many tear gas volleys fired into the park while I was there on June 11th. I personally think tear gas should be regulated internationally and be used only in truly and rarely dangerous situations. We need an arms control treaty on tear gas. Not only is it not non-lethal, it has become a way to deny freedom of assembly. I understand that there are some situations that the police do need to use non-lethal force. The situation, however, seems out of hand–instead of a high bar for use of this substance, it has become something that is just lobbed. Some of this also has been documented in my twitter feed (I can be found as @zeynep). I know that now I am going to be criticized heavily by some people in Turkey. Let me end with some clarifications. I have friends who are and remain strong AKP supporters and they, too, are mostly aghast at what has been happening. I’ve always tried to explain that the government has popular support and remains popular; however in a polarized country. Rumors of Internet shut-down are false. In fact, throughout the protests, I have been able to tweet, with pictures, from the park (some mobile operators brought extra repeater trucks to the area). I lost Internet only once–during the worst clashes– and I later learned that one of the repeater trucks was on fire, likely contributing to the problem as well as tens of thousands of people desperately trying to call out. However, I witnessed the ridiculous levels of media censorship first hand and I heard some stories directly from journalists. Some people asked my why I don’t go interview AKP supporters and their use of social media? In fact, I’d be happy to, at some point. I study social movements and social media so it is natural for me to interview protesters. The notion that AKP supporters do not use social media is false. The idea that AKP is just behind the times with such technologies is also false. The prime minister did indeed call Twitter a menace (or curse) to society, but all his top lieutenants are on social media and very active. So are, as far as I can tell, large portions of AKP’s own public. AKP is a tech-savvy party full of competent people. There is simply no comparison to Mubarak’s inept misunderstanding of the new media ecology. And that’s it for now. 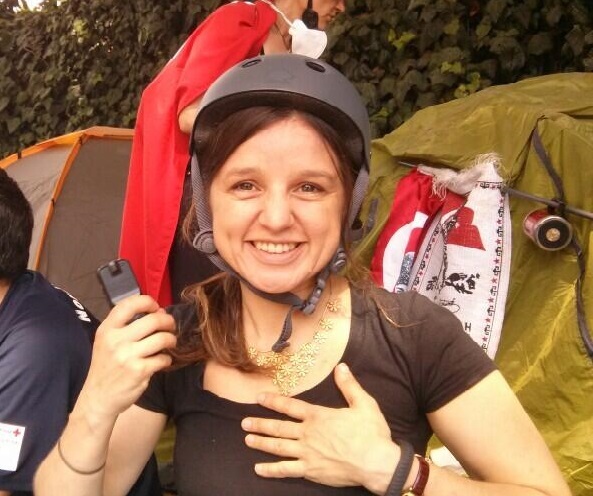 I am now going to go back to the battered, tired Gezi Park and continue doing interviews for as long as I can. 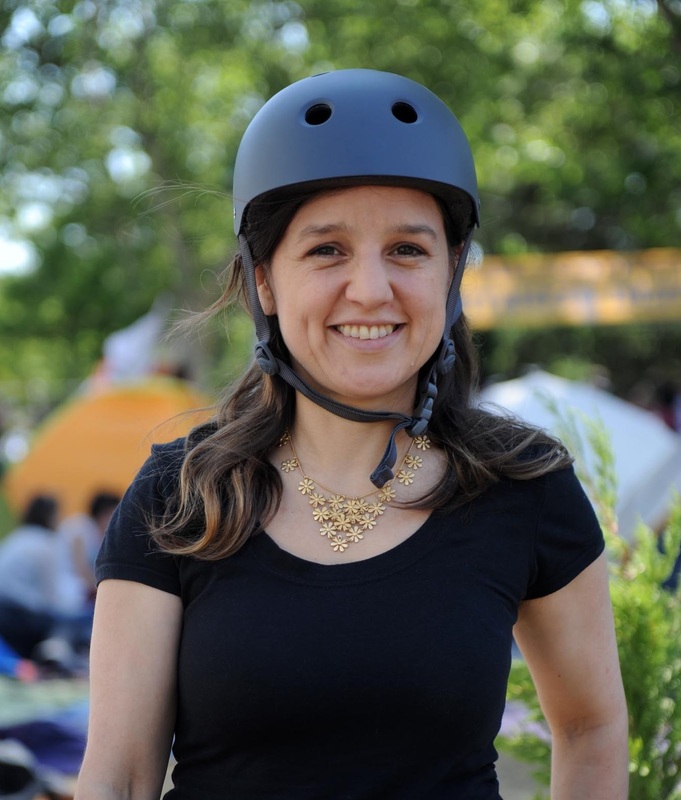 I shouldn’t have to interview with a helmet, though, in fear of tear gas canister landing on my head. The governor keeps promising that the park won’t be attacked. Here’s me interviewing yesterday in the park, and here’s hoping to less tear gas. Note: Hastily written, sorry for typos and lack of more links. To be corrected later. This entry was posted in Uncategorized on June 12, 2013 by zeynep. I’ve written about the abject failure of Turkish media to adequately cover the news of the most important protests in the country since the 1980 coup. Many media outlets aired irrelevant documentaries and talk shows (talk show about legal definitions of theft, cooking shows, dolphin training, etc) while clashes spread to dozens of provinces and many neighborhoods in many major cities. In fact, CNN Turkey’s (owned by Time Warner and Turkish Dogan media group) airing of “penguin” documentaries during intense clashes (while CNN International reported news from Turkey!) became a protest meme. The next day, he was not allowed to air live and his fate remains uncertain. Here’s a short clip of the game. After the clip, the full list of questions and answers. This entry was posted in Uncategorized on June 5, 2013 by zeynep. Turkey, my home country, is known for big demonstrations. After the Arab Spring, there were demonstrations of about a million people in Diyarbakir (a predominantly Kurdish region) and people asked me if this was Turkish spring. I laughed. Diyarbakır can have a million people to have party to sneeze together. The Kurdish opposition is well-organized and has always been able to bring large numbers to streets. May Day celebrations in Taksim, Turkey are legendary (they alternate between lethal and joyous and are often quite large). But they are also always organized by trade-unions and political parties. Turkey has has a variety of large demonstrations over the years. Not a single large, widespread spontaneous one, though. The last somewhat organic, widespread demonstrations I can remember in the 1980, post-coup era are the “1989 Spring” workers’ strikes and actions which were widespread and which culminated in the Zonguldak mine workers strike. And those were also somewhat- to completely-led by the trade unions. Pretty much every other large, impactful political gathering in Turkey I know of has been organized by a traditional institutions. So, Turkey has been a NAACP country, not Tahrir. So, let’s get some of the Tahrir/Taksim comparisons out of the way. Turkey’s government, increasingly authoritarian or not, is duly elected and fairly popular. They have been quite successful in a number of arenas. They were elected for the third time, democratically, in 2011. The economy has been doing relatively well amidst global recession, though it has slowed a bit recently and there are signs of worrisome bubbles. So, Turkey is not ruled by a Mubarak. But it’s also not Sweden. The government has been displaying an increasingly tone-deaf, majoritarian-authoritarian tendency in that they are plowing through with divisive projects. (I should add that the opposition parties are spectacularly incompetent and should share any blame that goes around). The government has also revolutionized Turkey’s government” services through the expansion of a spectacular level of e-government–which has greatly eased many people’s lives as bureaucracy is a major quality of life issue in countries like Turkey. This, in turn, has altered power relations between civic servants (who form the majority of the secular middle-class which does not vote for AKP) and the mass of citizens (many of whom do vote for AKP). However, the expansion of e-government has also enabled and been accompanied by expansion of state surveillance. [So, in many ways Turkey is both more free and less free]. So, what’s the underling structure of the protests? It’s an increasingly tone-deaf, majority government who is relatively popular but is pursuing unpopular, divisive projects; an incompetent opposition; a cowardly, compliant mass media scene PLUS widespread, common use of social media. In Turkey, especially in large cities, almost everyone has at least one cell phone, and many of them are Internet enabled. (You must provide your citizen ID number to get one which also means that the surveillance capacity is also broad although the amount of data means that the surveillance is likely targeted rather than just broad and random). Facebook is very common, with more than 30 million users. (It’s in the top ten worldwide). About 16% of the Interet population also uses Twitter and, as in here, Twitter is very important exactly because who those 16% are. (In fact, probably more important because it is not everyone and creates a somewhat more exclusive space though that is eroding). One area that has been creating increasing tension between the Turkish government and many citizens in Istanbul has been the urban renewal projects undertaken by AKP. Some, for sure, are popular like the “metrobus” that zips between the two continents in a dedicated lane, bypassing the torturous traffic jams. Others, like the “renewal” of the wonderful, unique tapestry of Tarlabaşı near Taksim, home to Roma, transexuals, urban poor and other misfits, by bulldozing this area to throw up soulless, concrete and glass structures to be built and sold, helpfully, by the prime-minister’s son-in-law, are largely unpopular ,both among the people who live in these areas or who inhabit the beautiful, vibrant areas around Taksim, Beyoglu, Cihangir. So, it is not a coincidence that the latest incident was sparked by attempts to resist renewal of the “Gezi park” area of Taksim which has the last teeny-tiny bit of green in a very concrete, overbuilt part of Istanbul, historic Taksim. There was some long and complicated back-and-forth about this which ended with the government announcing that all or parts of the park might be replaced with a … shopping mall. So, when a small –I repeat a very small, especially for Turkey– group of people tried to resist the bulldozers uprooting of the trees in Gezi to begin the construction, I did not think that much of it. 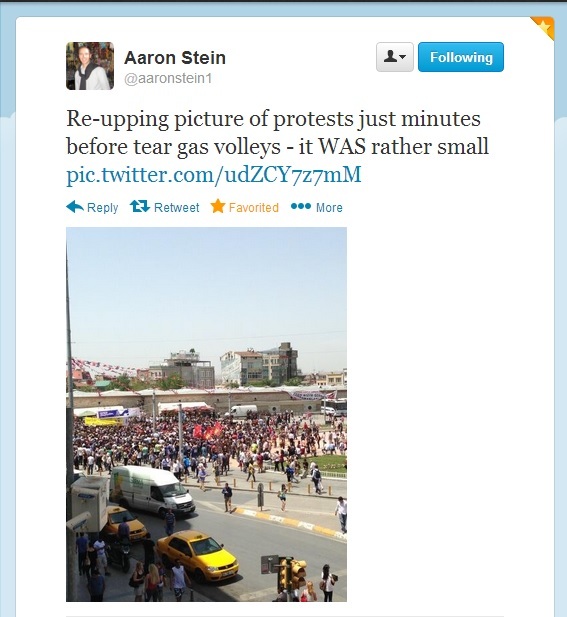 Here’s how small the protests were, from Aaron Stein’s tweet stream. What happened next was a horrific, disproportionate police response which included a lot of tear gas and beating up of protesters. However, I should note that this, too is not unprecedented. Not at all. This Reuters image, which rang around the world, makes the situation fairly clear. Then, the incompetent and cowardly media coverage started acting as usual–which meant a general blackout of crucial news. This, too, is not unprecedented. 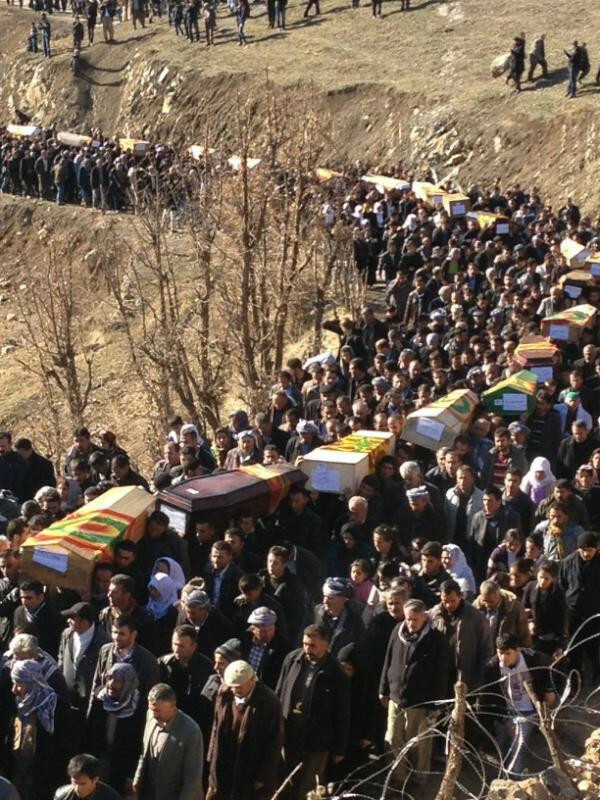 Many major news events, recently, have been broken on Twitter including the accidental bombing of Kurdish smugglers in Roboski (Uludere in Turkish) which killed 34 civilians, including many minors. That story was denied and ignored by mainstream TV channels while the journalists knew something had happened. Finally, one of them, Serdar Akinan, was unable to suppress his own journalist instincts and bought his own plane ticket and ran to the region. His poignant photos of mass lines of coffins, published on Twitter, broke the story and created the biggest political crisis for the government. Serdar, unfortunately, got fired from his job as a journalist. Here’s Serdar’s Twitter pictures breaking the news about the biggest political scandal in Turkey in years, in face of mass media silence on the topic. (Twitter search failing me in finding his original tweet but here he is telling people he is going to the area, by himself, as the silence about the bombings continues on media). 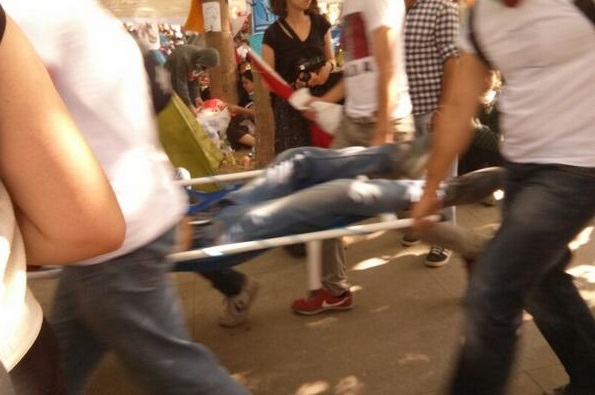 It was after the Gezi protesters were met with the usual combination of tear-gas and media silence something interesting started happening. The news of the protests started circulating around social media, especially on Twitter and Facebook. I follow a sizable number of people in Turkey and my Twitter friends include AKP supporters as well as media and academics. Everyone was aghast at the idea that a small number of young people, trying to protect trees, were being treated so brutally. Also, the government, which usually tends to get ahead of such events by having the prime minister address incidents, seemingly decided to ignore this round. They probably thought it was too few, too little, too environmental, too marginal. On that, it seems they were wrong. Soon after, I started watching hashtags pop-up on Twitter, and established Twitter personas –ranging from media stars to political accounts– start sharing information about solidarity gatherings in other cities, and other neighborhoods in Istanbul. Around 3am, I had pictures from many major neighborhoods in Turkey –Kadıköy, Bakırköy, Beşiktaş, Avcılar, etc– showing thousands of people on the streets, not really knowing what to do, but wanting to do something. There was a lot of banging of pots, flags, and slogans. There were also solidarity protests in Izmit, Adana, Izmir, Ankara, Konya, Afyon, Edirne,Mersin, Trabzon, Antalya, Eskişehir, Aydın and growing. So, as far as I can remember, these are the first protests in Turkey in the post-80 coup era that are less like NAACP-organized civil rights protests, and more like social-media fueled Tahrir protests. (Just so people don’t get confused, there are significant differences between Egypt 2011 and Turkey starting with the fact that AKP is a duly elected, relatively popular government that has been growing tone-deaf and authoritarian/majoritarian). So, is there a social-media style of protest? I think we have enough examples now to say there seems to be, and here are some of their common elements. (Examples include Egypt and Tunisia, M15 in Spain, Occupy, Gezi in Turkey, Greece, etc). On the other hand, this means that the movement cannot negotiate gains either because.. Well, because it cannot negotiate. 2- A feeling of lack of institutional outlet. In the case of Egypt, this was because elections were rigged and politics banned. In Turkey, media has been cowered and opposition parties are spectacularly incompetent. In Occupy in US, there was a feeling that the government and the media are at the hands of the moneyed interests and corrupt. 3- Non-activist participation. I think this is crucial. 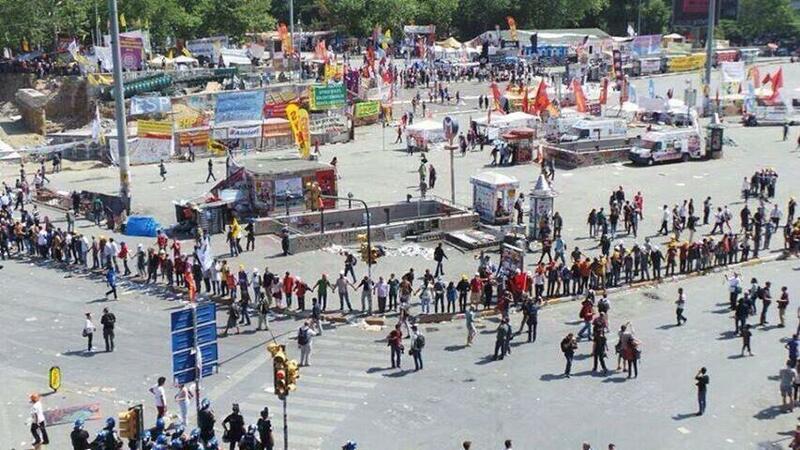 Most previous big demonstrations in Turkey are attended by people who have attended demonstrations before. Tahrir protests 2011, Tunisia December 2010, Gezi 2013 drew out large numbers of non-activists. 4- Breaking of pluralistic ignorance. I have made this argument before but revolutions, political upheavals, and large movements are often result of breaking of “pluralistic ignorance”–ie the idea that you are the only one, or one of few, with a view. Street demonstrations, in that regard, are a form of social media in that they are powerful to the degree that allow citizens to signal a plurality to their fellow citizens, and help break pluralist ignorance. (Hence, the point isn’t whether the signalling mechanism is digital or not, but whether how visible and social it is). 5-Organized around a “no” not a “go.” Existing social media structures allow for easier collective action around shared grievances to *stop* or *oppose* something (downfall of Mubarak, stopping a government’s overreach, etc) rather than strategic action geared towards obtaining political power. This is probably the single biggest weaknesses of these movements and the reason why they don’t make as much historical impact as their size and power would suggest in historical comparison. However, in the end, politics happens where politics happens and staying out or being unable to join results in a tapering, whimpering out effect as the movement slowly dissipates as it runs out of tactical moves and goas. 6-External Attention. Social media allows for bypassing domestic choke-points of censorship and reach for global attention. This was crucial in the Arab Spring (and we know many people tweeting about it were outside the region which makes Twitter more powerful in its effects, not less. 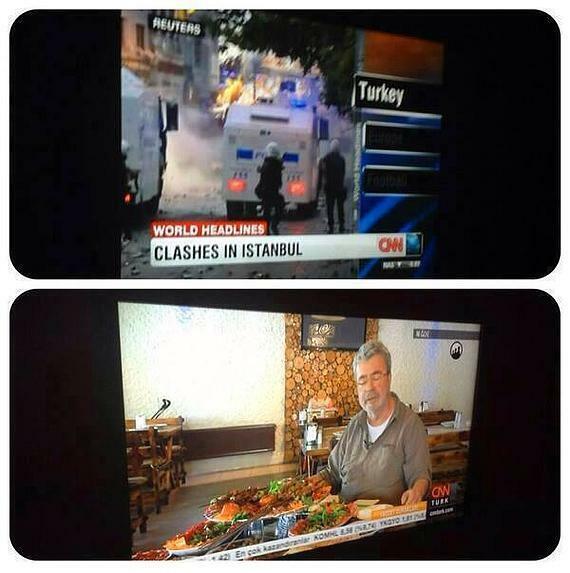 CNN International covers the Gezi protests while CNN Turkey shows cooking shows. Through social media, protesters learned that the whole world, or at least some portions of it, was indeed watching. Since protests are as much about signaling more than they are about force (as protesters are almost never more powerful than state security forces), this is a crucial dynamics. 7- Social Media as Structuring the Narrative. Here and in other protests, we saw that social media allows a crowd-sourced, participatory, but also often social-media savvy activist-led structuring of the meta-narrative of what is happening, and what shape the collective grievances should take. Stories we tell about politics are incredibly important in shaping that very politics and social media has opened a new and complicated novel path in which meta-narratives about political actions emerge and coalesce. 8-Not Easily Steerable Towards Strategic Political Action. This we have seen again and again and is related to point number 5. Social-media fueled collective action lacks the affordances of politics an institutional arrangement –political party, NGO, etc– can provide. Where is this going? I can’t offer predictions but I do emphasize that this is not going to topple the Turkish government by itself. This is not Tahrir, 2011, but it is an interesting inflection point among the frustrated but powerful segments of the Turkish society who believe that the current government has decided to run roughshod over them and cannot find efficacious outlets for their opposition. [added] Here’s a striking example of what media cowardice and self-censorship looks like. New York Times covered the Turkey protests on the front page of its online site. 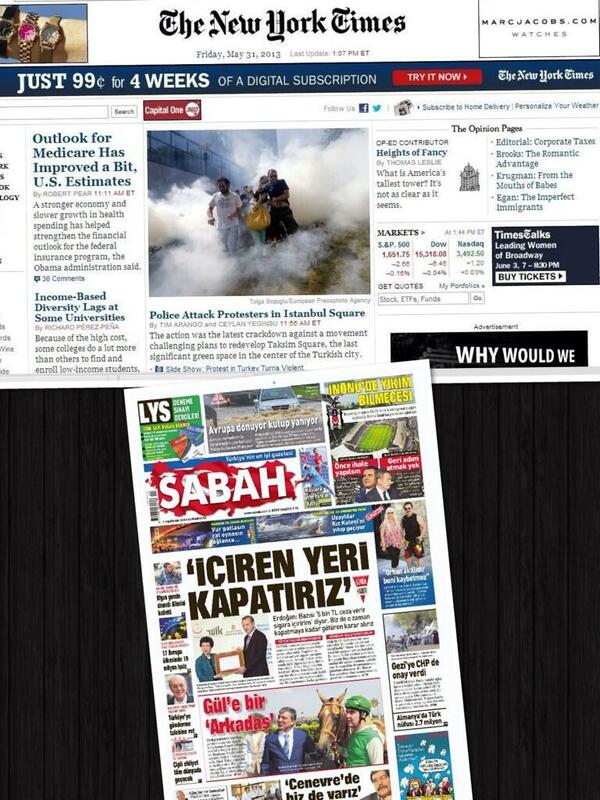 Sabah, a major newspaper in Turkey, did not put one of the biggest protests in Turkey on its front page at all. What happens next depends on many factors including the government response and the depth of the feeling among the Gezi protesters. I doubt, however, that this is the last social-media fueled protest we have seen. *** It should be needless to say at this point but just so someone who thinks this is somehow a profound comment doesn’t feel like they have to point it out fifty times in the comments section: OF COURSE REVOLUTIONS ARE MULTI-CAUSAL, COMPLEX EVENTS AND THE COMMUNICATION INFRASTRUCTURE DOES NOT CAUSE THE UNDERLYING GRIEVANCES BUT RATHER IT HELPS STRUCTURE WHAT KIND OF, IF ANY, COLLECTIVE ACTION IS ORGANIZED AROUND THE GRIEVANCES. **** (Also, I wrote this very fast in an otherwise very busy week. I will correct typos(! ), update links, as I get a chance!) This is a “fast and dirty” analysis, not meant to be comprehensive, include every factor, does not list every misstep by the government or by the protesters, nor does it provide the exhaustive or complete list of every factor! [Final Note: This was a hastily written post but I stand by the analysis, if not the clunky writing. 🙂 Those asking permission to translate. Thank you. Go ahead, just drop me a line and a link back here so I know about it. This entry was posted in Uncategorized on June 1, 2013 by zeynep.